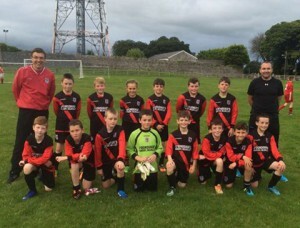 Erris United under 12’s first game of season away to Ballinrobe (23rd July) final score Ballinrobe3 Erris United5. Prior to the game there was a minute’s applause for Eric (rest in peace) the team was captained by Molly O’Connor who kept the lads on their toes throughout the game. Erris got off to a flying start with an early goal from James Lavelle and by half time Erris were leading by three goals to one with goals from Martin Mullarkey and a second from James Lavelle. 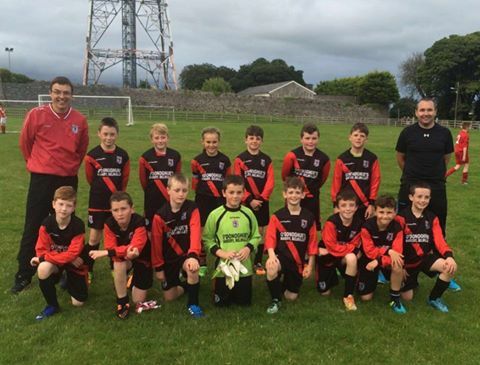 Iorras U12 with Managers, Lenny Gilbert & Andrew Bailen. In the second half substitutions were made and Erris managed to score two more goals from James Lavelle. Ballinrobe scored two goals to make score 3-5 there was a nail biting final few minutes for joint managers Lenny and Andrew. Victory was finally sealed as each and every player played their part in the game, many thanks to all the supporters who traveled up for match. The return journey home was very good spirited with the lads eating an unbelievable amount of sweets and drink (no ice creams on board) many thanks to our driver Derek .Finally James Lavelle is looking to get the match ball.